News - 1D's Harry hooks up with Alyssa? 1D's Harry hooks up with Alyssa? 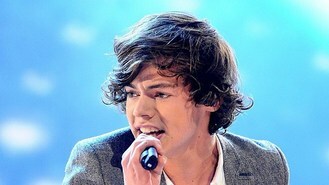 Ladies man Harry, 18, and Alone Again singer Alyssa, 19, have begun following each other on Twitter. Alyssa told The Daily Mirror about meeting the boyband backstage: "Yes I introduced myself... and I may or may not have got a phone number. "But I never kiss and tell. I'm not telling, I can't tell. I would never go for a taken man thought, so he must be one of the single ones." Harry and Niall Horan are the only single lads in One Direction. Alyssa added: "We're doing another show tomorrow so maybe I'll make a move then. I shouldn't have told you but I would love to cook for him - asparagus-stuffed chicken breast with hollandaise sauce. That's one way to get a man."